Have you ever had an aha moment that is immediately followed by a wave of deep sadness because it was during that aha moment, that you realized how bad things were going to be? This is what happened to me today. Out of nowhere, I gained wisdom about something I knew would be difficult, but the clarity of the situation really struck me. This wave of sadness has taken over my body and mind. What do we writers/bloggers do when we experience a deep emotion? We write, of course. It’s as if someone kicked me with all their force right in the gut. 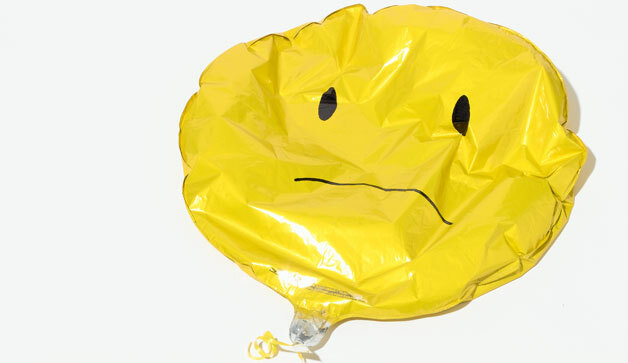 I feel like a shriveled up deflated balloon that moments before, was filled with air, joy and happiness. As many of you loyal readers know, I will have an empty nest this coming fall. I have written about it on many occasions. I talk about running around the house naked swearing like a sailor. About having more time with Mr. Brickhouse and even on how we will save on electricity. All in good fun. Today however, I don’t see it that way. Today, I truly understand the impact and meaning of this much-anticipated empty nest. Why didn’t I think of this before? Why didn’t I see it? How stupid of me to think otherwise. I was looking at an ideal life. An imagined vision of me stepping right into this next stage in my life with open arms. Blindly and naïvely envisioning a future when I could finally focus on myself, my goals, my health and my marriage. Stuck at home, by myself. With no purpose to my every day. No longer needed by anyone. Just me and my thoughts. Just me and my illness. I already spend a lot of my days on my own. I am usually too fatigued to be involved in multiple activities. I see friends when they are not working, I try to walk, I blog, I watch tv and I mother. Mothering has given me a purpose and an identity. The fact is that Mr. Brickhouse has a very demanding job. He is gone all day and most nights, at meetings. I know this. I have known this. I have accepted this. But now, it saddens me to no end. I cannot depend on him to be there. It is not fair to expect him to fill my void. My aha moment made me realize the reality of what awaits me. What plans do I have? The fact that I cannot hold a job due to my illness has bothered me in the past but I knew deep down that the most important job I could do, was being the best mother I could be, despite my physical limitations. Wake up. Rest. Wait until my body is not stiff. Eat breakfast. Rest. Run an errand. Rest. Blog. Rest. Pay bills. Rest. Go for a walk. Rest. Eat dinner on my own. Rest. Blog. Sleep. Repeat. This will be my life. It leaves me vulnerable with thoughts I have repressed for way too long. It leaves me with just me. I will allow these feelings to simmer for a day or two because they need to. Maria! We are on parallel courses, aren’t we? This being disabled stuff is very difficult, isn’t it. Sometimes we have to force ourselves to get out there or figure out how and what we need. I’m learning that I need less time with others than I thought I did… But I still need people, yes yes and yes. It’s hard to make new friends at this juncture in our lives and ultimately all we have us ourself so we’d. Enter learn how to be content. It’s a bitter pill to swallow, isn’t it? Realizing we put our eggs in one basket. I’m learning how to exist one moment at a time, like you. But I’m so inspired to know I’m not alone on this journey. You are there with me. You always have been. Well, you’re more sanguine about it than my parents were, I think. They had quiet ways of trying to hold on to my youngest sister before she got fully settled down. And she’s fully settled down, of course– I mean, we were chuckling over the phone the other day how those of us with kids seemed to wind up with boy/girl pairs… no joke, I have a daughter, a son, and two sets of a nephew and a niece each. I don’t think I mentioned her kids. Usually she refers to them as “Chiquita” and “Chato”. Holy Crap! I was just thinking about you and this very same experience like two days ago. I was watching Enough Said on HBO and the parents in the movie are going through that whole empty nest deal and they were hurting too. And then I got all sad because I realized that that “mack truck” is gonna run me over in the future and it totally got me all emotional. Dude. And then I thought Holy Crap Brickhouse is going through this very same thing! So I tried to send you some light and love and happy thoughts. I do imagine that it’s heartbreaking and sort of an end of one extremely awesome phase of your life, so be sad if you need to totally valid and totally understandable. But it’s a beginning of another one where your daughter is an “adult” and you get to see what an awesome job you’ve done as a mom. I’m sure my mom felt the same once me and then my sister moved out. Just remember the great job you did as a mom and now they are grown adult because of your great mothering. They won’t forget that. Take up some new hobbies. Catch up on reading. Maybe start another blog. The world is your oyster now. I would totally hang out with you too, Maria. I think it will not be as scary as it sounds, especially once you start painting. Try not to think about it too much. Hugs! Giving you a big hug right now. Not, that it’s anywhere close… My kids are camping with the grandparents for 3 days. I always tease them about loving having an empty and quiet house, but as I sit here today, it sinks in, that sooner rather i could imagine, this will be an everyday thing…. Big Hugs for you! Ah! I wish we lived closer! I would totally hang with you. I can serve as a reminder of those school-aged fighting kids. But seriously, I’m glad you wrote this post. My kids are going to stay with their Nana this week. I start to feel sad after about a day or so. I don’t know what to do with myself. You described it perfectly. I need to get Scott a sailor suit. Well, first of all, you should be basking in the glow of doing a job well done for raising a kid who can live on their own. And you aren’t going to be alone. You are going to be with somebody awesome. You are going to be with you. Yep, all those thoughts and feelings are valid. But in time, they’ll pass. You’ll see something that catches your eye, and start doing that a a hobby, or return to things that interested you long ago and take them up again. And we’ll get to hear all about your new life! Oh Maria! So glad you shared where you’re at. (Love Andra’s answer.) My sister-in-law is going through this too, with my nephew going away to college in the fall. I’ll definitely be thinking of you both. That’s right, I remember you were telling me about your nephew’s graduation! I went through this with my son and miss him terribly but it’s no easier with the second! I think it’s tougher. In trying to understand my feelings, I see that that they stem more from a sense of insecurity and the anticipation of the ‘unknown’. What will I do with me? What will define me? How will I fill my days? I hear you. My nephew is the second one to go to college. His sister went two years ago. So the empty nest yawns before my brother and sister-in-law. They’re both sad. Is there some place you could volunteer? Yes, I know I will find some things to fill the days like volunteering. I was just struck by the realization that I will be on my own for most of the days. I will do what my body allows and get as involved as I can. I just have to get through this sadness. Reading this post brought me back to the two days when we moved my daughter, and then 4 years later, my son, into their respective colleges. Andra described it perfectly: I went into mourning. Both times. It is like a death of sorts. The death of the previous relationship with your child. Of course they are still my children. Of course they still came back home after (daughter is still here, for crying out loud, long 3 years post graduation) – but it’s never the same. They move into adulthood when they move into that college dorm. And it’s heartbreaking. So you take whatever time you need to feel as sad as you feel. I get it. Add to all that your RA, and it’s no wonder you feel deflated, depressed, sad. I’m sending you the biggest virtual hug. Be well, amiga. It’s hard to read these kind words from all of you without tearing up! I love that I can count on you to sprinkle some humor into your comments that crack me up! I am so happy for my kids, it’s figuring out what I will do next that is hitting me. I don’t want too much idle time with my thoughts because it is easy to fall into some sort of depression. I usually try not to allow my illness to define me and to call the shots but with the loss of a ‘job’ and ‘duty’, I am afraid I will think too much about what could be and what I wish was. You are smart, funny, beautiful and driven. You will find your ‘what’s next’. Don’t rush it. Rock on, mama! I share these feelings myself…my daughter is a senior this year, and although she thinks she is going to a local college and staying at home, I know this could change in a moment. I still have a hard time believing that she is almost an adult…now that I am disabled, what will I do with myself? It frightens me. Thanks for sharing your feelings. What a tough time this is. I’ll keep you in my thoughts over the next few months… and then look you up for advice when my final one leaves! This sounds so familiar, it is where I was a couple of years ago. My daughter had left home, and for awhile I was going a little stir crazy trying to figure out what to do with myself. At the time I had no hubby to talk to in the evenings. I spent a lot of time online, probably too much, met with other people for lunch sometimes, went to the library quite a bit and read books. I know it probably sounds really dull, and not horribly exciting. But eventually, I found things to do, and ended up meeting my now hubby through a mutual friend. The twist to this whole story is, that a year later, we both ended up with a surprise mid-life baby. So in just the space of three years I have gone from empty nest to starting all over again. I know how you feel I felt the same way when I dropped my youngest off at kindergarten. I had been anticipating the event for months and broke down into gut wrenching sobs when I left him at the door to his kindergarten room. I wrote about that day on my blog. I think it was the post “You don’t have to scoot over.” You may want to read that if you like. I think it may comfort you. My blog is http://www.spotublog.com. For the record I usually don’t self promote in the comment sections of others blogs but I was hoping that if you read the post you would receive comfort. Hugs to you my dear. Letting go is the hardest part. All very valid feelings…..sigh…..sending you hugs, love, sangria and more love and hugs. And because I have an “extra” child with us for the whole summer and one who will be a high school senior in the fall, I will try to savor each and every motherhood moment. Feel sad. You earned that with all these years of hard mothering, Maria. Sometime, when you’re ready, you’ll have another aha moment, I think. You’ll come up with something that will make you happy, I have a feeling. If the illness left you with enough in your tank to be the mother you needed and wanted to be, it will give you enough to be what you want to be for yourself, I have an inkling. May that be more writing? You are a great writer, I know. Hugs to you. Embrace your anticipated emptiness. Savor it. Wallow in it. Then, pick yourself up and move forward. It’s a new phase and it opens up all kinds of opportunities. I rattled around for a year before I started writing. When my daughter graduated from high school, I had it pretty easy since she went to college in Boulder. Now that she has moved to Denver, I felt that familiar sadness of missing my kids. It’s just far enough away that I won’t see her as often. I’ve been spoiled. My advice is to book flights to go and see her as well as friends and family! I started to cry about it the year before my son left!!!! I used to have a hard time going into their bedrooms. Don’t worry. They always come back!!! First of all, here’s a massive hug I wish I could give you in person right now. Cry as much as you need to. Question as much as you like. Ache and grieve and mourn. From the time a child is born, parenthood is an exercise in ceding control, but nothing drives that home like the final one leaving home. I’ll be thinking of you often in the coming days and weeks. And I’m still expecting you to come and visit, with or without Mr Brickhouse.